MSI GeForce RTX 2080 Ti Lightning Z 11 GB Graphics Card Review - The Card That Goes SHAZAM! I’ve looked and compared the performance of several GeForce RTX 2080 Ti and GeForce RTX 2080 custom variants and consider them to be a good gain over their predecessors, the GTX 1080 Ti and GTX 1080. When it comes to pricing, the GeForce RTX 20 series are some of the most costly graphics cards NVIDIA has offered to consumers. The reference variants are great with their new cooling design and good looking shrouds but AIBs have some really great custom solutions out there, several of which I have already compared next to each other and with the reference variants. MSI has been offering some great custom designs since the GeForce RTX 20 series launched but there’s one card that the real enthusiasts were waiting for and that’s the Lightning. Designed for LN2 overclockers and those who want the best, the Lightning series from MSI has been at the top of the spectrum, offering the best in class performance and overclocking capabilities that only a few other custom boards can match. Starting with the first Lightning cards back with GeForce GTX 200 series, the Lightning series has seen various iterations and we are getting the latest one with the GeForce RTX 20 series cards. Today, I will be taking a look at the MSI GeForce RTX 2080 Ti Lightning Z, the best variant of the MSI Lightning graphics card and also the most expensive graphics card in production by MSI, aimed at the enthusiast community. 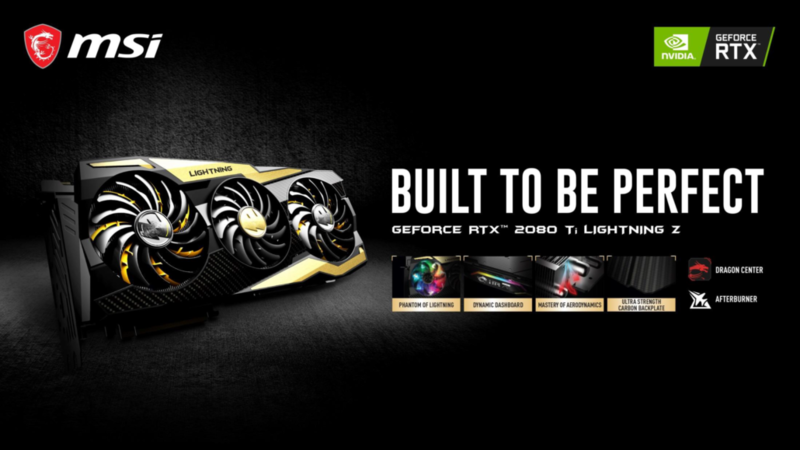 The RTX 2080 Ti Lightning Z is a journey of 10 years of Lightning cards innovation which has been incorporated in a single enthusiast grade custom graphics card based on NVIDIA’s latest GPU architecture.